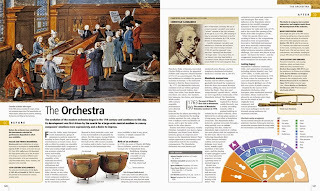 The Orion Orchestra's concert at the South Bank Centre's Queen Elizabeth Hall on 9 December 2013 is something rather different. 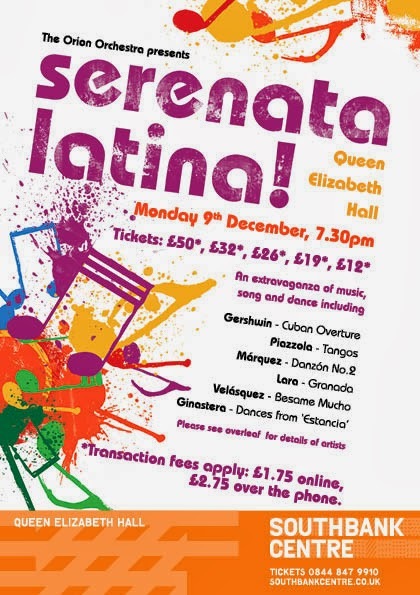 Brain-child of the orchestra's artistic director Toby Purser, Serenata Latina combines the Orion Orchestra with Latin-American soloists and dancers and a London-based jazz group to provide and evening of Latin American dance and song. The Orion Orchestra, conductor Toby Purser, will be performing alongside jazz group the James Pearson Trio, Mexican tenor Jesus Leon (who impressed immensely in Grange Park Opera's I Puritani this year), violinist Lizzie Ball and dancers Raquel Greenberg and Omar Ocampo. The programme includes orchestral music by Gerwshin, Marques, Ginastera and Romero, plus songs by Lara, Gardel, Freire, Velazquez and Cortez and tangos by Piazzolla, Gardel and Ponce. The Orion Orchestra is a young group, its members selected from young musicians leaving music college, so we can expect fireworks. Sound just like the sort of evening to bring a flash of Latin warmth to a cold December Monday. Further information and tickets from the South Bank Centre's website. 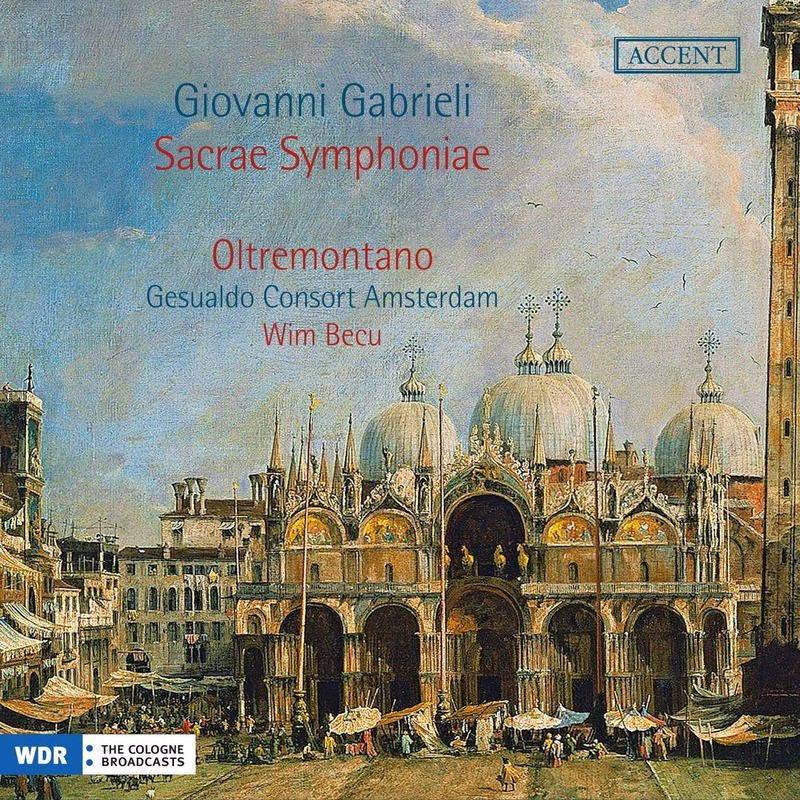 On this new disc from the Gesualdo Consort Amsterdam and the instrumental ensemble Oltremontano, directed by Wim Becu, is a selection of motets and instrumental pieces from Giovanni Gabrieli's Sacrae Symphoniae of 1597. The collection, originally printed by the Venetian publisher Gardano, comprised 45 motets and 16 instrumental pieces (canzonas and sonatas). We are treated to five canzonas, one sonata and ten motets in performances which are performed by a flexible mixture of performers taken from the seven voices of the Gesualdo Consort Amsterdam, and the 15 performers of Oltremontano (violin, viola, cornetts and sackbuts); the ensemble has a preponderance of sackbuts. 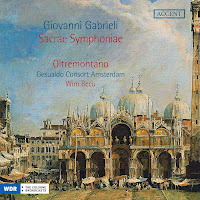 Even Gabrieli's motets were intended to have a mixture of instrumental and vocal performers, with a degree of flexibility being possible. Though all the parts were often given texts, the expectation was that in the larger pieces the very upper part would be played on a cornett and the very lower one on a sackbut. Here, the ensemble give us a fine variety of scorings. 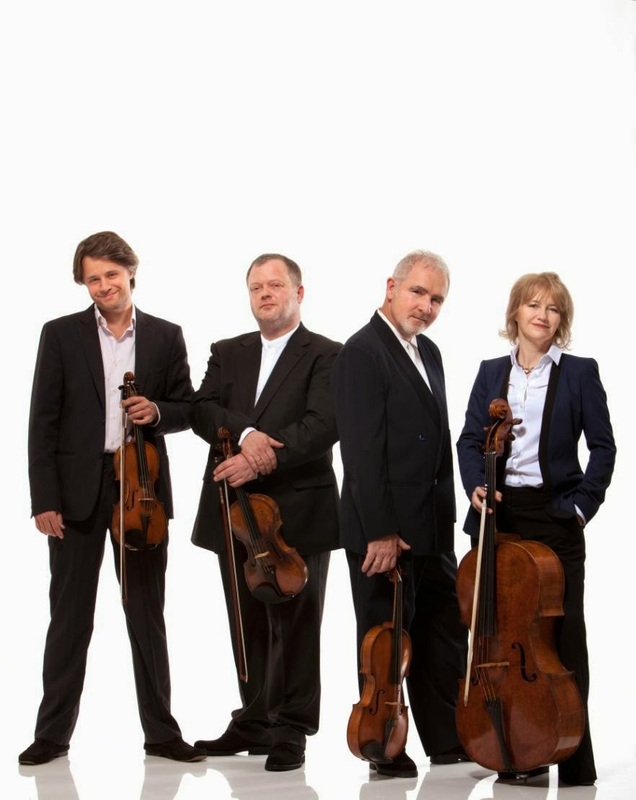 The Benyounes Quartet have been performing a series of concerts at St John's Smith Square. Entitled Britten+ the concerts have involved the quartet and friends in Britten's chamber music alongside other major works from the repertoire which influenced him. For their final concert, on 28 November they were joined by cellist Philip Higham. The Benyounes Quartet played Britten's Simple Symphony then Higham played Britten's Cello Suite no. 3 before joining the quartet for a performance of Schubert's String Quintet in C, D956. 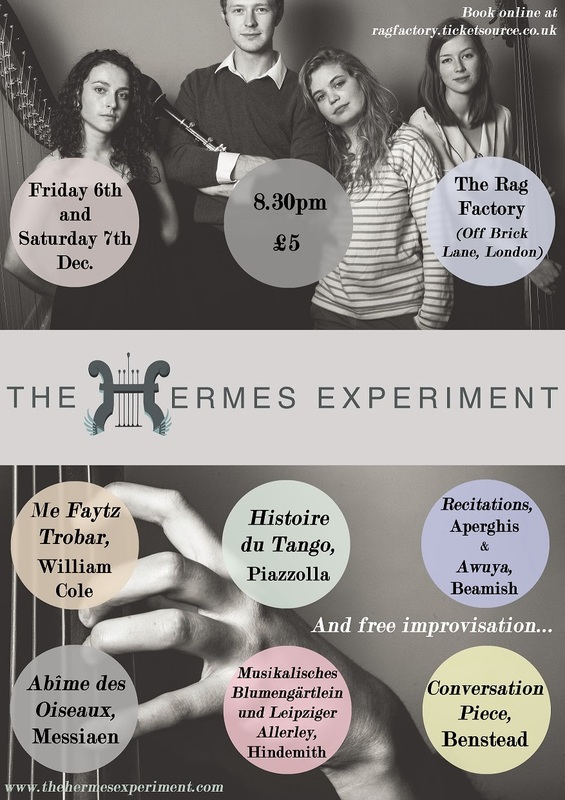 The Benyounes Quartet (Zara Benyounes, Emily Holland, Tetsuumi Nagata and Kim Vaughan) is a young group, formed at the Royal Northern College of Music in 2007. In 2012 they won the 1st international Sandor Vegh String Quartet Competition in Budapest. They are currently resident at Bangor University and are Park Lane Group Young Artists. 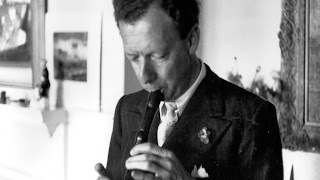 The concert opened with Britten's Simple Symphony, a work which Britten wrote for string orchestra in 1933/34 basing it on themes from pieces which he had written as a teenager. It was written for amateur performance by a string orchestra, and inevitably performance by a professional string quartet changes the work's character. The quartet opened the Boisterous Bouree with nice crisp playing, but I did wonder whether their approach made it sound a little too arch. The Playful Pizzicato was highly effective and they made a lovely rich sound in the Sentimental Sarabande. But this is a piece which really does call out for sweep of massed strings. The Frolicsome Finale was suitably fast and furious. 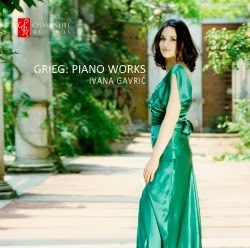 Pianist Ivana Gavrić recently produced her third CD, of Grieg piano works, on the Champs Hill Records label and to launch the CD gave a lunchtime recital at the Wigmore Hall on 28 November performing Ravel, Janacek, Cheryl Frances-Hoad and Greig. Gavrić opened her recital with Maurice Ravel's Valse nobles et sentimentales. 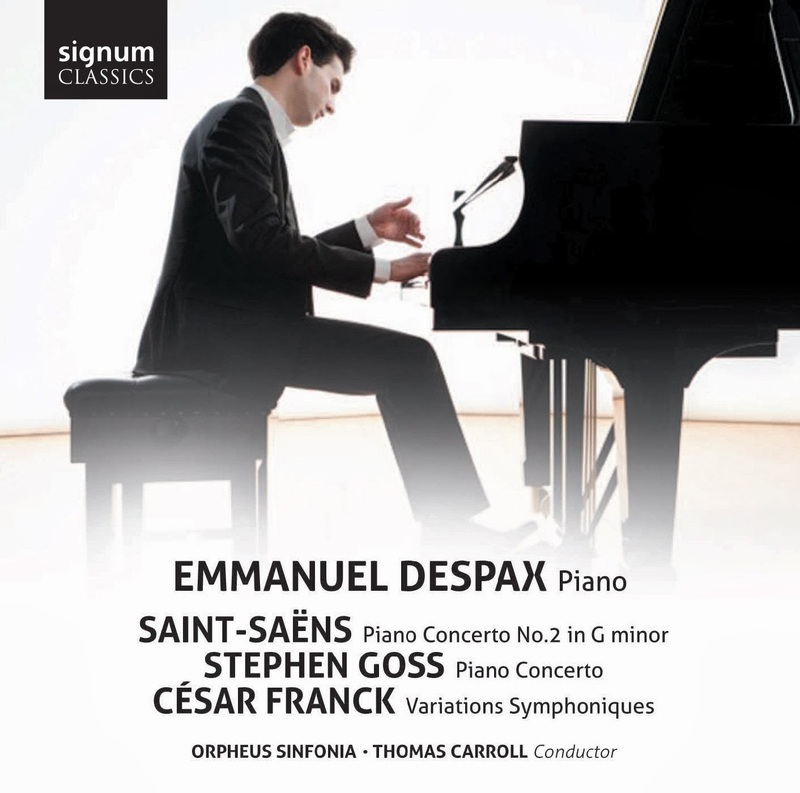 Premiered in Paris in 1911, the work was given anonymously and came in for some criticism with most of the audience failing to recognised it as the work of Ravel. Gavrić's performance of the piece had a wonderful flexibility with clarity of texture and transparency. Her delicate touch brought out the hints of Ma mere l'oye in some of the movements and gave a rippling delight in the faster sections. But this was poetry combined with technical facility and power when needed. The final waltz, with its reminiscences of previous material was a lovely phantasmagoria. On Thursday 12 December a group of distinguished singers and actors is presenting a Christmas Gala Concert at St Johns Smith Square. Billed as A Celebration of Christmas in words and music the event is in aid of the charity Young Epilepsy. The gala is organised by the mezzo-soprano Jean Rigby, abd she will be joined by Dame Felicity Lott, Susan Bickley, Finnur Bjarnason, Mark Padmore, Alan Opie, Brindley Sherratt and Maria Friedman with pianist Jason Carr. The theme of the gala is Christmas, so that each artist will be performing one or two Christmas songs, and they will join together for some ensemble numbers such as The Twelve Days of Christmas and Stille Nacht. 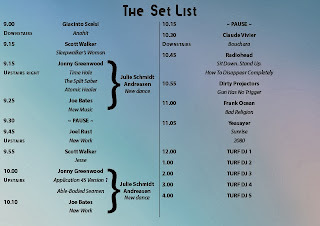 The second half is planned to be more jazzy, for instance Susan Bickley, who was once a member of the Swingle Singers, will be singing a John Dankworth number. The event will open with carols from the girls choir Viva Voce, followed by a film about Young Epilepsy. During the film pianist Jason Carr, who also writes for musical theatre, will provide improvised accompaniment. There will be imaginative lighting as well, making the hall more festival and highlighting the purple that is in Young Epilepsy's logo. A number of groups are taking part in this year's Big Give Christmas Challenge. From Thursday 5 December to Saturday 7 December, donations given via The Big Give website will be matched £1 for £1 with money from the Challenge Fund. The challenge opens at 10am each day and lasts until the funds run out; there is a total of £2m available in matching funding; if you leave it too late during the day to give and funds have run out then you have to wait until 10am next morning for further funds to be released. 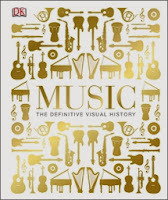 Only two days left in which to enter our competition to win a copy of Dorling Kindersley's book Music: The Definitive Visual History, see our competition page for details. Whilst the practice of doing studio recordings of opera isn't exactly dead, it is certainly rather moribund. The majority of major new recordings are tied in to live performances and certainly the idea of taking a company into the recording studio to record, say, Berlioz's Les Troyens, belongs to a different world. So it was with some degree of pride that last week that Bogdan Roscic, the head of Sony Classical, announced that Sony were releasing a new set of Mozart and Da Ponte's three operas (Le Nozze di Figaro, Cosi van Tutte and Don Giovanni). 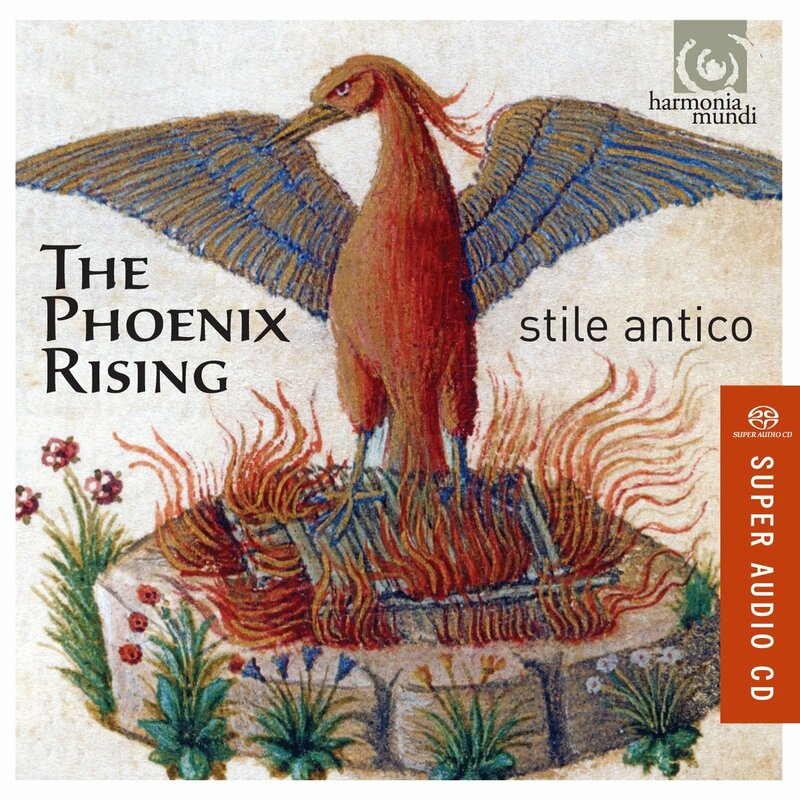 These are being recorded by the Russian trained Greek-born conductor Teodor Currentzis with his group MusicAeterna. The name Currentzis may flag up that this project is no ordinary recording. For a start, the recordings are being made in Currentzis's home base, in Perm (which is 1400 km East of Moscow, and is the most easterly city in Europe). And they are being made under Currentzis's own conditions, which means that he chooses the casts and that there is extensive rehearsal time. Le Nozze di Figaro and Cosi van Tutte have already been recorded, and Figaro was recorded in sessions of up to fourteen hours a day over eleven days and nights. 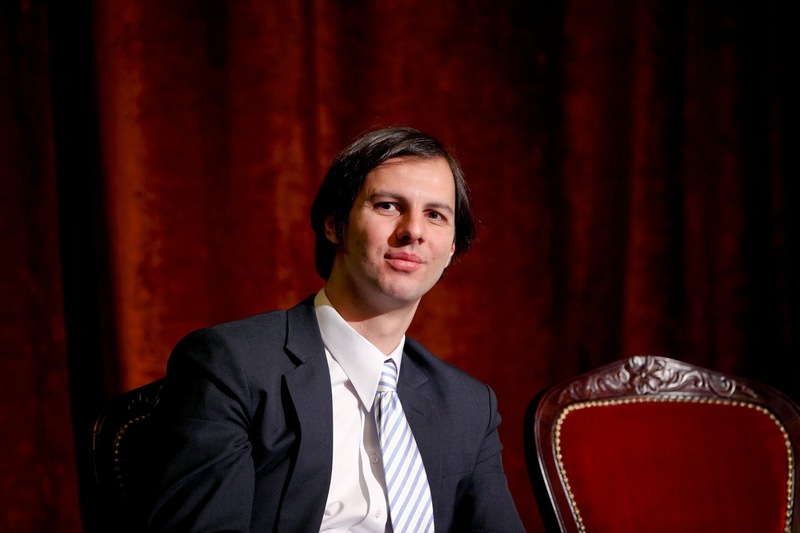 I first came across Currentzis in 2011 when I reviewed a recording of Mozart's Requiem which he made in Novosibirsk with Musica Aeterna (Currentzis was based in Novosibirsk before moving to Perm). The recording seemed remarkable, but contained no explanation as to why and how it came to be made. Currentzis was born in Athens in 1972, moving to St Petersburg in 1994 to train with Ilya Musin. 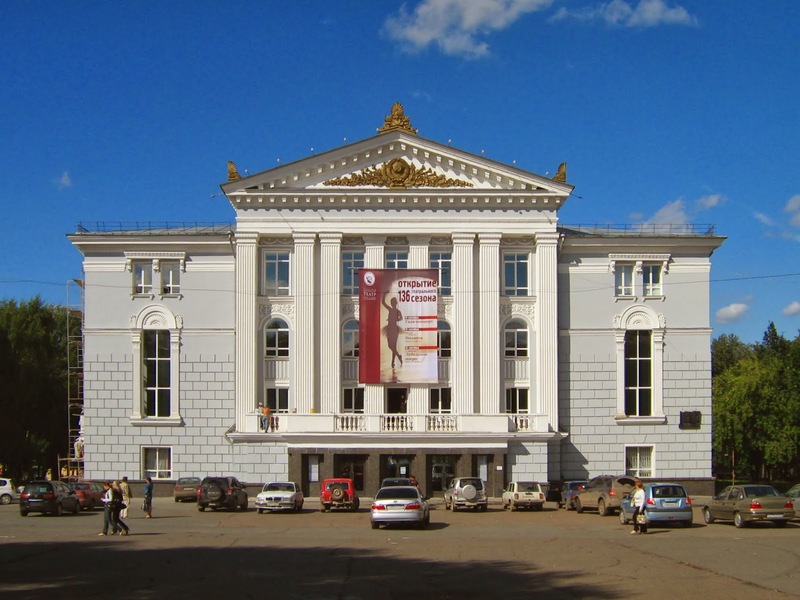 He became music director of Novosibirsk opera in 2004, making headlines with such productions as Dmitry Tcherniakov's Aida set in a war zone (the Balkans or Chechnya). But the defining moment was his move to Perm, where he negotiated dream conditions. Most lieder singers who come from a background where their native tongue is something other than German or French tend to try an include a set in their own language, often using folk-song to create relaxed final set. In the case of Anglophone singers using either folk-song or English song, this is often the first time that they have sung in the audience's native language. But, as anyone who has been to on of Njabulo Madlala's recitals knows, Madlala rather turns this upon its head. UK trained but born and brought up in South Africa (in Durban) the final sets of Madlala's recitals are often made up of South African songs, with English song taking its place in the body of the recital along with the German lied. 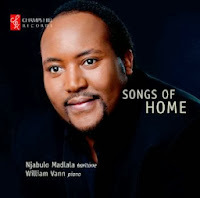 This is reflected in his new disc, he is accompanied by William Vann in a programme which mixes South African songs with lieder by Strauss, Schubert and Schumann, and songs by Roger Quilter, RVW and Herbert Howells, plus a spiritual. The disc's title Songs of Home reflects the programme, a sense of the singer's very personal journey. From the songs of his native South Africa learned from his grandmother, through German lied learned originally from a recording his grandmother gave him through to the English song of his adopted country. In many ways it is quite a daring programme, but one that works because Madlala and Vann treat each song with equal care and the programme is a testament to both their commitment and to the beauty of Madlala's voice. Young conductor takes Dudamel's place on the podium. You couldn't make it up. 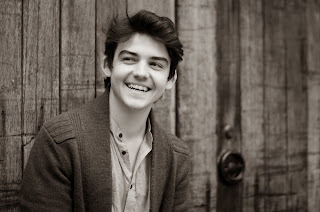 24-year-old Lahav Shani won the Bamberg Symphony's Gustav Mahler Conducting Competition in June 2013, beating 400 applicants and 11 other finalists to the top place. Then Gustavo Dudamel, who won the competition in 2004, was due to return to Bamberg to conduct the orchestra, went and cancelled. Dudamel was replaced by Shani at short notice. The event seems to have gone well, and a short film on YouTube provides interesting footage of Shani conducting along with interviews with him and with a number of seasoned professionals in the orchestra. It makes for interesting watching, and helps explain why an orchestra might play so well for a 24 year old. 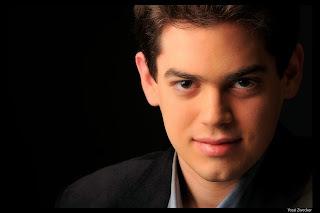 Born in Israel, Shani lives in Berlin and is a protege of Daniel Barenboim; Shani was invited to open the 2013/14 season of the Israel Philharmonic Orchestra – with seven concerts in Tel Aviv, Jerusalem and Haifa, in which he both conducted Mahler's Symphony No.1 and directed Bach's Concerto for keyboard in D minor from the piano. 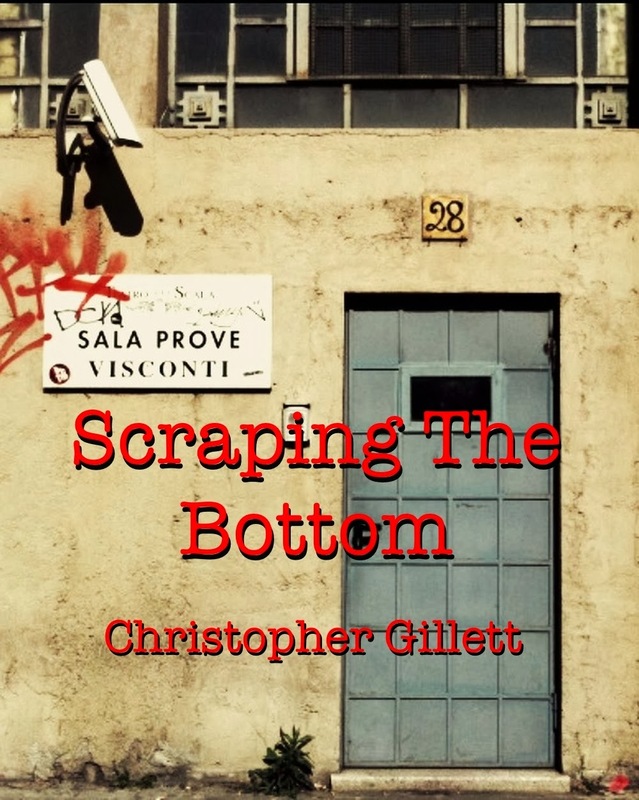 Scraping the Bottom is a follow up to Christopher Gillett's previous book Who's My Bottom, charting the further adventures in the life of an itinerant operatic tenor. Gillett has a nice eye for the telling anecdote, and the book combines reportage on various engagements in Montpelier, Paris, Amsterdam and Milan. Part of the joy of the book is that Gillett reveals the everyday tedium and anxieties of life as a singer, working in opera houses away from home, struggling with rented flats, foreign cultural habits, recalcitrant coffee makers, operatic managements and conductors. Whilst we might suspect him of exaggeration for effect, in fact that rather Eeyore-like view of things tallies which what I have heard from other singers. Spending your life in foreign climes, struggling with the vagaries of operatic managements and transport arrangements just isn't particularly fun. Like his previous book, the story is written as a patch work of anecdotes, threaded together on a narrative. 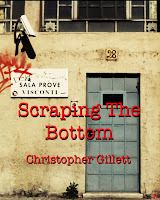 This time the narrative concerns the imagined glamour of an opera singers life, which Gillett seeks to puncture, but the second half develops further as he gets asked back to La Scala, Milan of Peter Grimes and rehearsals turn eventful. But the book isn't just about what happens on stage, there is a great deal of mooching about and dealing with life on the road. Gillett is able to be amusing about this, but he makes sure that we never take this for granted, pain is often round the corner: when working in Montpelier, Gillett has to deal remotely with his teenage son having an accident. On Sunday 1 December, the British Art Music Series is presenting a pair of concerts at the St James's Theatre in aid of Sense, the charity for Deaf Blind people. The London Contemporary Orchestra will be performing Silent Shakespeare, in which seven early silent films of Shakespeare's plays are being shown with a score for small orchestral ensemble by Laura Rossi. The films, from Britain, Italy and the USA, were made between 1899 and 1911. The films are King John (UK, 1899), The Tempest (UK, 1908), A Midsummer Night’s Dream (USA, 1909), King Lear (Italy, 1910), Twelfth Night (USA, 1910), The Merchant of Venice (Italy, 1910) and Richard III (UK, 1911). Rossi has written extensively for film, most recently for Song For Marion starring Vanessa Redgrave and Terrence Stamp. Since 1998 she has been writing music for the British Film Institutes re-releases of silent films. Rossi's score Silent Shakespeare was last heard in London over a decade ago. Further information and booking from the St James's Theatre website. Sudwestrundfunk (SWR), the broadcaster which covers the states of Baden-Württemberg and Rhineland-Palatinatein Germany, is causing anger and concern with its decision to merge its two surviving orchestras, the SWR Sinfonieorchester Baden-Baden und Freiburg (SO) with the Radio-Sinfonieorchester Stuttgart des SWR (RSO). The decision to merge the ensembles seems to have already been taken, rather than being a proposal, and will take effect from 2016. An open letter objecting to this cultural vandalism signed by over 160 distinguished signatories was published earlier this month, and has so far only elicited a rather unsatisfactory reply from SWR. The open letter is available at the Frankfurther Allgemeine Zeitung website, but I am publishing the English version in full below (click on the more link). François-Xavier Roth is the current Chief Conductor of the SWR Sinfonieorchester Baden-Baden und Freiburg, and the orchestra has a distinguished history dating back to 1946 with past conductors including Hans Rosbaud. On Sunday 1 December 2013 at the Royal Albert Hall, 1200 young people from 42 schools and youth choirs will come together with the English Festival Orchestra and soloists, Daisy Brown, Rosemary Clifford, Oliver Johnston and Gareth Brynmor John, all under the direction of Suzi Digby OBE, to perform Handel's Messiah. The concert is an extension of the annual Messiah from Scratch which has been at the Royal Albert Hall each Christmas since 1974, and both are promoted by Scratch Concerts Limited. Sunday's Scratch Youth Messiah aims to encourage young people to perform Handel's Messiah in its full SATB version. Choirs can choose to sing as few as three choruses or as many as eleven, depending on their level of experience. In fact over half the choirs have chosen to learn everything. Mentors from the National Youth Choirs of Great Britain and the London Youth Choirs will be on hand to provide vocal support to encourage the least experience singers. The events starts at 2.15pm on 1 December at the Royal Albert Hall. This disc is one of the fruits of composer Julian Anderson's residency with the London Philharmonic Orchestra. Resident since 2010, Anderson has had a number of works performed by the orchestra and this disc includes three works of them. 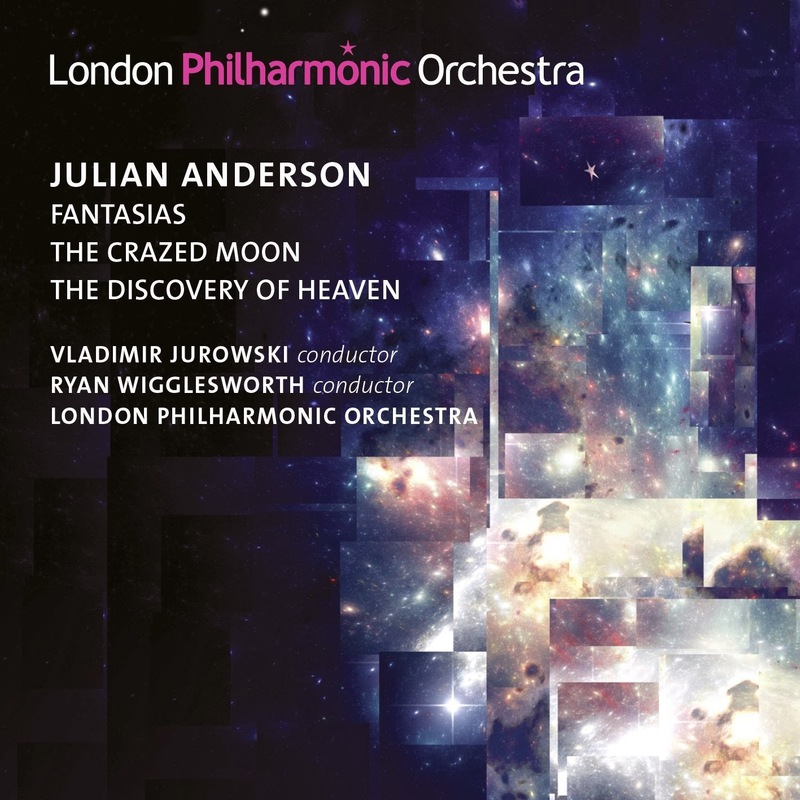 The Discovery of Heaven was written specifically for the London Philharmonic Orchestra and premiered by them in March 2012, conducted by Ryan Wigglesworth, recorded live for this disc. Also on the disc are two of Anderson's earlier works, Fantasias and The Crazed Moon, also recorded live, conducted by Vladimir Jurowski. Julian Anderson has had quite a number of residencies, having been composer in residence with Sinfonia21 from 1996 to 2001, composer in association with the City of Birmingham Symphony Orchestra from 2000 to 2005, in 2002 he became artistic director of the Philharmonia's Music of Today series, and from 2000 to 2007 he was the Cleveland Orchestra's Daniel R. Lewis Young Composer Fellow. The first work on the disc, Fantasias dates from 2009 and is a product of Anderson's period working with the Cleveland Orchestra and was premiered by them in 2009. This is the work's world premiere recording. Fantasias is in five movements, with the form of each movement deliberately unpredictable. Anderson's use of an older form in the title, allows him the freedom to have the music undergo sudden changes of timbre, tempo or harmony. Jessica Duchen's new play Sins of the Fathers was given a rehearsed reading at the Orange Tree Theatre in Richmond as the final event in this year's Wimbledon Music Festival. Illustrated with the composers' music, the play looks at the relationship between Richard Wagner, his second wife Cosima and her father Franz Liszt. John Sessions played Richard Wagner and Jeremy Child was Franz Liszt. The third actor, Sarah Gabriel, didn't play Cosima but a contemporary figure Vickie who got mixed up in their world. The play had been billed as a simply exploring 'the intriguing relationships' between the three characters. This was a potentially very dark subject, neither Liszt nor Wagner seem to have been very pleasant characters, but then such is the way of genius. As a way of providing a modern critique of their attitudes, Duchen had created something which was rather more intriguing and complex in structure. The BBC had put together a pretty spectacular cast for their performance of Britten's Albert Herring on Saturday 23 November at the Barbican. One of the culminations of the celebrations of the composer's centenary on Radio 3 and at the Barbican Centre. Steuart Bedford conducted members of the BBC Symphony Orchestra with Andrew Staples in the title role, Christine Brewer as Lady Billows, Marcus Farnsworth as Sid, Kitty Whately as Nancy, Catherine Wyn-Rogers as Mrs Herring, Gaynor Keeble as Florence Pike, Gillian Keith as Miss Wordsworth, Adrian Thompson as Mr Upfold, the Mayor, Roderick Williams as Mr Gedge, the vicar, and Matthew Rose as Superintendent Budd, plus Eleanor Maloney as Emmi, Emily-Jane Thomas as Cis and Archie Buchanan as Harry. The performance was billed as semi-staged, but it was for more than that. The instrumental ensemble was placed upstage centre, with two acting areas either side. Stage left was the Herrings' shop, complete with a shop door and a table of fruit and vegetables. Stage right was Lady Billows's house, becoming the venue for the fete in act two. Perhaps most importantly, the cast were all off the book (many having sung their roles in other productions) and Kenneth Richardson's production was lively, inventive and sympathetic. The cast were in modern dress, generally in character with Christine Brewer's Lady Billows resplendent in three different stylish outfits complete with some magnificent jewellery. The advantage of the performance was that it put the orchestra centre stage, giving us the chance to appreciate the brilliance and imagination of Benjamin Britten's orchestration (12 players including a piano played by the conductor). 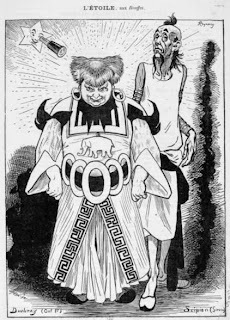 Satyagraha – holding onto truth or ‘truth force’ - was a term invented by Mohandas Gandhi to embody his belief that forms of persuasion that do not use physical force or cause suffering are more effective than violence. In a world where on every front page there continue to be wars and atrocities, with one group fighting or oppressing another, the hope that there should be another way is appealing. Satyagraha by Philip Glass (first performed in 1980 in Rotterdam) looks at the origins and the effects of Gandhi’s teaching. Events in Gandhi’s personal history are set into the lives of people whose teaching he influenced, Leo Tolstoy, Rabindranath Tagore, and Martin Luther King. This was Glass’s second opera and part of a trilogy looking at revolutionary ideas. For me Satyagraha is an oratorio not an opera – and the version which premiered on Wednesday (19 November) at the ENO was no exception. Alan Oke was Ghandi with a cast including Janis Kelly, Stephanie Marshall, Nicholas Masters, Clare Eggington, Eddie Wade, Sarah Pring and Nicholas Folwell, conducted by Stuart Stratford in a production directed by Phelim McDermot and designed by Julian Crouch. The performers, singers, actors, and puppeteers alike, all moved in slow motion, dulling any hint of physical drama. The ENO tried to offset the lack of action by the use of puppets and tableaux but, while these were imaginatively and quirkily done, without the programme notes it would be impossible to follow. Mostly the performers stand in a row and sing. The physical transformations of the cast between acts were also confusing. The changes were sometimes so extreme, while the costumes in each setting were so similar, it was hard to follow who someone was, especially when they were in a scene but did not sing or interact, but just stood there smiling. The Christmas Festival at St. John's Smith Square is now an established event and this year's is the 28th. This year we have Christmas music familiar and unfamiliar from Schutz, Bach, Victoria, Guerrero, Cipriano de Rore, Lassus and John Rutter. Performers include a fine array of college choirs with the choir of Kings College, London, the choirs of Clare College and of Trinity College, Cambridge, and Christ Church Cathedral choir, Oxford. Plus Oxford Baroque, the Brabant Ensemble, the Cardinall's Musick, the Tallis Scholars, Polyphony and the Orchestra of the Age of Enlightenment. 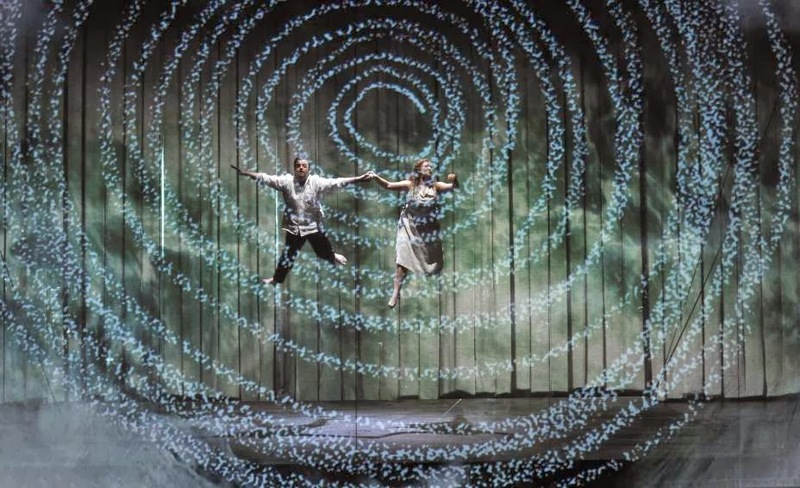 The premiere of Simon McBurney's production of Mozart's Magic Flute was reviewed on this blog by Hilary. I caught the production for the first time last night (22 November). Gergely Madaras, the inaugural recipient of the ENO's Sir Charles Mackerras Conducting Fellowship, conducted a strong young cast with Ben Johnson (an ENO Harewood Artist) was Tamino and Devon Guthrie was Pamina, with Roland Wood as Papageno, James Creswell as Sarastro, Cornelia Gotz as the Queen of the Night, Brian Galliford as Monostatos and Eleanor Dennis, Clare Presland and Rosie Aldrige as the three ladies, with Mary Bevan as Papagena. Michael Levine's set was simple looking but probably far more complex than it appeared, a simple platform which tilted and raised surrounded by drop curtains on which projections could be seen. It was a production which heavily relied on video (video design by Finn Ross). Much (but not all) the video was handled by a video set up on stage right, which allowed for real-time cartoons but combined with other video into something which was entrancing and imaginative. The orchestra was raised which meant that they could see the singers and interact with them, in fact there was much coming and going between stage and pit. There was a sense that music was the origin of the whole production, both the magic flute and the bells were played by orchestral musicians with the players given the instrument by the singer. Then there were the birds. Actors sat by the side of the orchestra pit during the overture, with music on music stands. When Roland Wood as Papageno played his pipes (in fact a melodica) the actors started to articulate the music and turn the sheets into birds. Each time Wood played his pipes these birds appeared all over the stage. 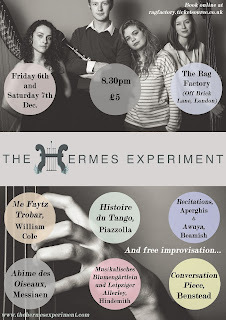 My 2013 season overview of the Brighton Early Music Festival is now on the Culture Trip website. 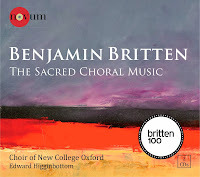 These discs from the choir of New College, Oxford, under Edward Higginbottom, represent an admirable survey of Britten's unaccompanied choral music which might reasonably be sung within the liturgy of the church. Some of it was explicitly designed for church use, though a projected complete set of canticles never achieved completion, but many of his major works are possible in church services. This means that on this disc we not only have the canticles and occasional anthems, and the Missa Brevis in D but also the Hymn to St Cecilia, A Ceremony of Carols, Rejoice in the Lamb and two movements from AMDG. That the choir of New College, Oxford, uses trebles on the top line casts an interesting light on some of the music which we are more used to hearing performed by mixed ensembles.The discs were recorded in 2011 and 2012 and released on the choir's Novum label at the beginning this year, but the disc seemed a fitting tribute to Britten on his birthday. This is particularly the case in the Hymn to St Cecilia but the music fits the sound of the choir brilliantly, their fine grained but narrow focussed tone combines strength with transparency and gives a lovely lightness to part one. In part two we have some brilliantly pointed rhythms from the trebles with fine, pinpoint infectious vividness. There is a lovely moment at the beginning of part three, which leads to a very fine treble solo from Inigo Jones. The balance here between soloist and choir is different to what might be achieved with a female soloist, but Higginbottom and his forces make it work brilliantly. I don't know what sort of choir Britten was thinking of when he wrote the Hymn to St Cecilia but it works well with a choir of men and boys, fitting their style perfectly. Named for the patron saint of horn players, Les Chevaliers de Saint Hubert is an ensemble of four natural horn players. Normally the ensemble would consist of Anneke Scott, Joseph Walters, Jorge Renteria-Campos and Martin Lawrence. But Jorge Renteria-Campos was injured in the Santiago rail crash, so at the ensemble's lunchtime concert on November 21 at St. Olave's Church, Hart Street, Renteria-Campos's place was taken by Ursula Paludan Monberg with a retiring collection being taken as a benefit for Renteria-Campos. 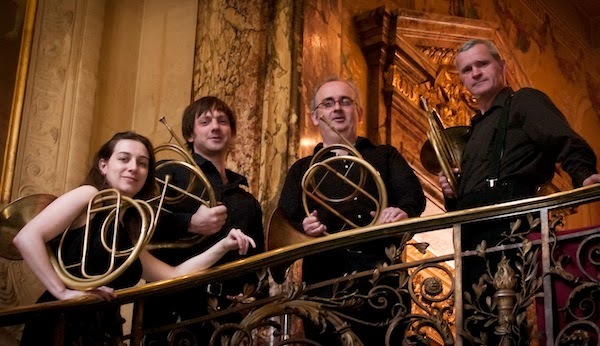 The concert was to launch the ensemble's recent recording (see my review) of music for horn ensemble by the French 19th century horn virtuoso Jacques-Francois Gallay. They played one of Gallay's Le Saint Hubert Fanfares en Trios pour trois cors en Mi, his Deuxieme grands trios pour trois cors en Mi, Op.24 and his Grand Quatuor pour quatre cors en differents tons, Op.26 plus the Trio No. 6 en Mi (Canon a 3) Op.32 by Anton Reicha. Until I heard their recent recording, I was totally unfamiliar with the world of horn ensembles. Gallay's music is written for hand stopped horns even though the valve horn was already in existence; French horn players held on to the hand stopped horn for far longer than anyone else. They seemed to relish the greater array of colours that hand stopping brings. Because notes not on the horns harmonic scale are produced by stopping the end of the horn with the hand, each note has a different colour and timbre. Gallay, who was a supreme virtuoso on the instrument, exploits this to perfection. Britten's canticles are not strictly a set, each was written under slightly different circumstances but together they form a satisfactory whole covering a substantial period of Britten's composing life from 1947 to 1975. The Temple Singers, members of the Holst Singers, choristers from Temple Church Choir, oboist Nicholas Daniels and the Aurora Orchestra under conductor Roger Sayer joined together at the Temple Church on 20 November in an all Britten programme celebrating the composer's centenary. The Temple Singers sang Britten's Antiphon, Op.56b, Hymn to the Virgin and Five Flower Songs, Nicholas Daniels played the Six Metamorphoses after Ovid, Op.49, then the Temple Singers were joined by members of the Holst Singers and the Aurora Orchestra for a performance of Britten's cantata St. Nicolas with Sam Furness singing the tenor solo. The conductor was Roger Sayer, the music director of Temple Church. Britten's Antiphon was written for the centenary of St Michael's College, Tenbury in 1956 and the text involves repeated statements in God's praise by the choir, men and the angels (solo sopranos). 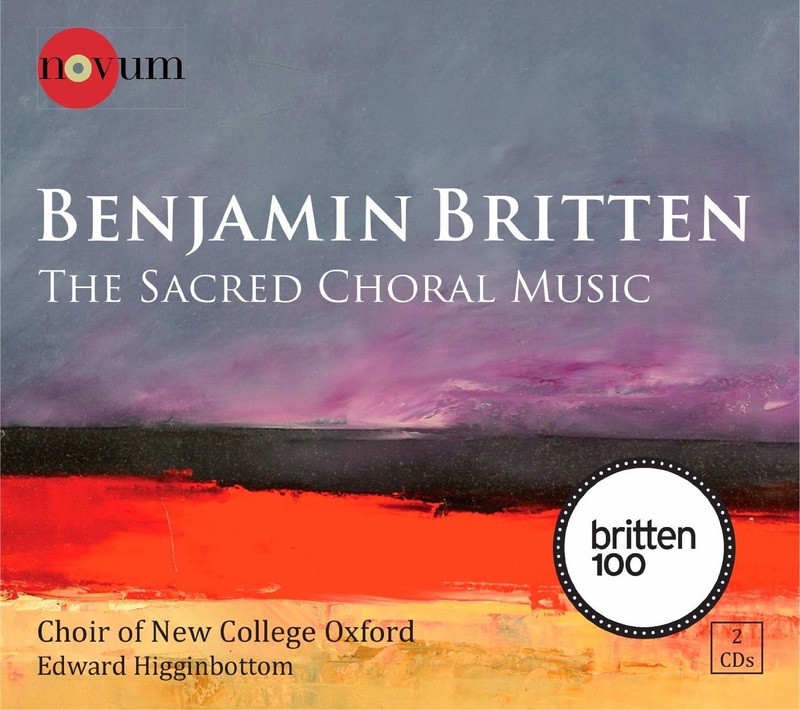 Britten uses two different qualities of music, with lively choral outburst alternating with slower contemplative music for the male chorus and for the solo sopranos. Much of the work's interest comes from the Tavener-like interaction between the two and it was a shame that Roger Sayer did not take advantage of the church's acoustics and have the solo sopranos separate from the main body of the choir as Britten suggests. The music of Claude Vivier and Giacinto Scelsi combined with sixties minimalism, filth-funk and other striking musical images. It music be Filthy Lucre, a multi-genre new music night which combines contemporary classical, orchestrated covers of pop songs and DJ sets. They specialise in immersive experiences and coherent artistic concepts. 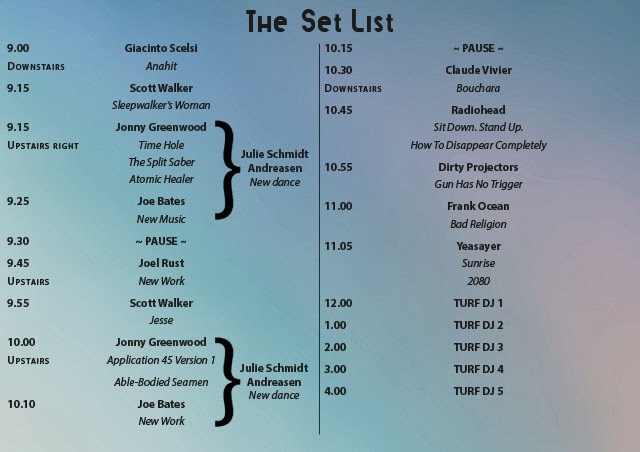 Their next event is on 11 January 2014 at the Bussey Building, Peckham. The theme is Cults and the programme is an intriguing mix centred around Vivier's Bouchara (soloist Juliet Fraser) and Scelsi's Anahit. Will Cole will be conducting the 20 piece Filthy Lucre Orchestra, there will be new dance and new works from Joe Bates and Joel Rust, with choreographer Julie Schmidt Andreasen. Filthy Lucre invites you to join our cult, to take part in an unmissable ceremony of music, art, dance and intoxication. For one night only, London's best up-and-coming musicians come together for a sonic ritual that moves from the stage to the dance floor. 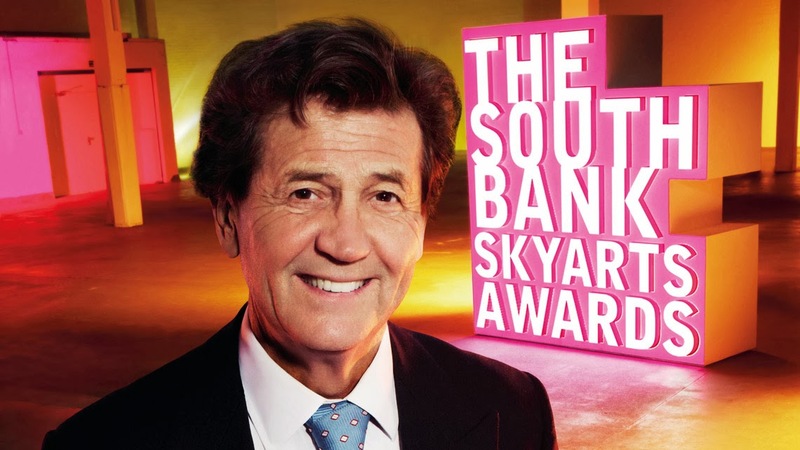 The nominees have been announced for the 2014 South Bank Sky Arts Awards. The awards ceremony is on 27 January 2014 and will be broadcast on Sky Arts on 30 January. The Classical Music category includes the South Bank Centre's festival The Rest Is Noise, Harrison Birtwistle's Songs from the Same Earth performed at The Britten Festival, Aldeburgh Festival and Thomas Ades' Totentanz, BBC Proms, Royal Albert Hall. The Dance category includes three very different works, Wayne McGregor's Atomos from Random Dance, Dracula from the Mark Bruce Company and English National Ballet's production of Petipa's Le Corsaire. 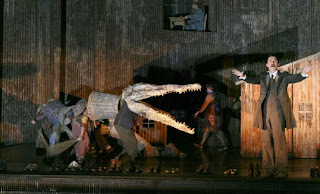 The Opera category has three very strong productions, George Benjamin's Written on Skin at the Royal Opera House, Britten's Paul Bunyan from Welsh National Youth Opera and Grimes on the Beach at the Aldeburgh Festival. This Friday, besides being St. Cecilia's Day and the 100th anniversary of Benjamin Britten's birth, is also Dame Myra Hess Day at the National Gallery. The day celebrates the achievement of the pianist Dame Myra Hess in putting on a series of concerts at the National Gallery every day of the week throughout the Second World War. The first concert took place 10 October 1939, a piano recital from Myra Hess "in case the whole thing is a flop". On Friday, there is the chance to hear Piers Lane recreating the recital, there is a talk on music during the Second World War and and evening concert from the Endellion String Quartet. 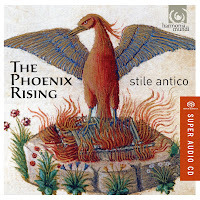 This summer the vocal ensemble Stile Antico released their disc Phoenix Rising (see my review) in celebration of the centenary of the Carnegie UK Trust and celebrating the influential edition of Tudor Church Music published by the trust between 1922 and 1929. This publication effectively enshrined the canon of Tudor church music for choirs. 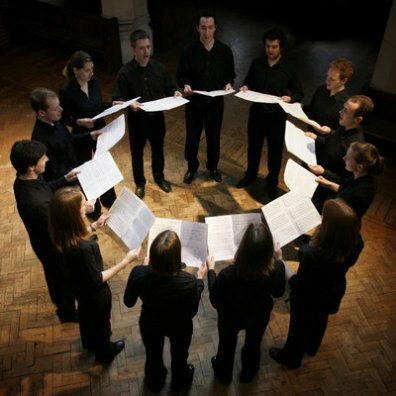 In Stile Antico's concert at the Cadogan Hall on 19 November 2013, as part of the Choral at Cadogan series, the ensemble performed music from the publication. Whilst in a sense this might have been the concert of the CD, this is music which responds to live performance, especially in performances as controlled and finely wrought as these. The centre-piece of the programme was William Byrd's Mass for five voices, and alongside this were motets, anthems and sacred madrigals by William Byrd, Thomas Tallis, Thomas Morley, Orlando Gibbons, Robert White and John Taverner. They opened with one of the best known and best loved of pieces in the whole repertoire, William Byrd's Ave verum corpus (which had sold over 16,000 copies by 1930). The ensemble made a fine, full sound with finely shaped phrasing and a wonderfully full, well nourished tone. 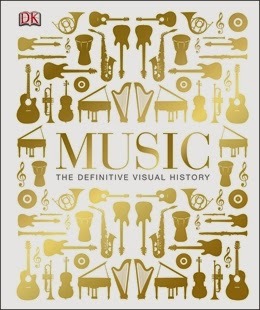 There are less than two weeks to go in our competition to win a copy of Dorling Kindersely's book Music: The Definitive Visual History. All you need to do is tell me your favourite composer and why, further details from our Competition page. New Sussex Opera are back this week with performances of yet another gem from the repertoire. Chabrier's L'Etoile isn't perhaps quite as forgotten as some operas, I can remember a lovely production from Opera North in the 90's (directed by Phyllida Lloyd with Patricia Helen Stephen as Lazuli). But it certainly has not had the exposure recently that the piece deserves and New Sussex Opera's new production is heartily welcome. 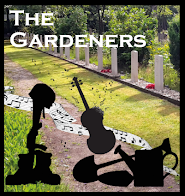 Directed by Sussannah Waters, designed by Nicola Blackwell and conducted by Nicholas Jenkins, performances take place in Lewes Town Hall (20/11), Devonshire Park Theatre, Eastbourne (24/11), Chequer Mead, East Grinstead (27/11) and Cadogan Hall, London (29/11). Katie Bray plays the loveable rogue, Lazuli, (a travesty role), with Stephanie Corley as Princess Laoula, Neil Jenkins as King Ouf, Geoffrey Moses as Sciroco and Paul Curievici as Herisson de Porc-Epic. 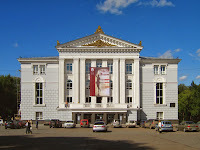 The opera was premiered in 1877, at Offenbach's Theatre des Bouffes Parisiens. It is the second of the composer's six surviving operas, and perhaps the only one with a completely viable combination of music and libretto. The libretto of L'Etoile was by the established partnership of Eugene Leterrier and Albert Vanloo who wrote librettos for Lecocq and wrote Mam'zell Moucheron for Offenbach, and they would go on to write Une education manquee for Chabrier. The name of Howard Blake is immediately synonymous with the music written for the film The Snowman, beyond this his name might recall the scores for films such as Ridley Scott's The Duellists. 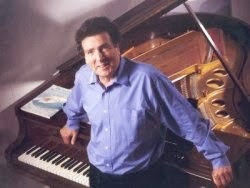 But Blake has also had a parallel career writing concert music with works ranging from his piano concerto commissioned for the Princess of Wales's 30th birthday, through his oratorio Benedictus to his Diversions for cello and piano which he is recording next year with the young German cellist Benedict Kloeckner. I recently heard Benedict Kloeckner and Howard Blake playing a programme of Howard's music for cello and piano as a celebration of the composer's 75th birthday. At the concert Howard talked of his working on the cello part of the Diversions with the great French cellist Maurice Gendron. Subsequent to this I found I could find no record of Gendron having played the work (Howard's website is admirably comprehensive). So when I met up with Howard Blake to talk about his music and his career it seemed natural to start off our conversation by asking about Diversions. We met in his studio, a former artist's studio on a top floor in Kensington, double-height, top lit, with both a computer and a piano, walls lined with books, pictures and CDs, a record of a long working life; a lovely room in which to work. In person Howard Blake is charming and seemingly possessed of almost total recall, able to talk with ease about events in the past. He uses his website to store all the details of his various performances and during our conversations occasionally pauses to check a detail on his pc. 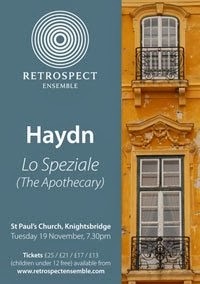 Haydn's opera Lo Speciale (The Apothecary) gets a rare outing tomorrow (19 November) when the Retrospect Ensemble give a semi-staged performance in a new English translation by John Warrack. Directed by Joe Austin and conducted by Justin Doyle, the performance takes place at St Paul's Church, Knightsbridge with a strong cast which includes Robert Murray, Ildiko Allen, Alexander Sprague and Louise Innes. Haydn's opera was written to inaugurate the new opera house at Esterhaza in 1768. The comic opera has a libretto by Carlo Goldoni, and was very popular on its first performances. The plot includes a number of devices such a lovers in exotic foreign disguise which recall Mozart's operas. Formed in 2009, the ensemble's first artistic director was Matthew Halls who has recently moved to the Oregon Bach Festival. This concert is Justin Doyle's first engagement with the ensemble as artistic director. Justin Doyle is Principal Conductor of Manchester Chamber Choir and of Manchester University Chorus and Musical Director of Opera North Children’s Chorus, and has been Artistic Director of Ryedale Festival and Swaledale Festival. 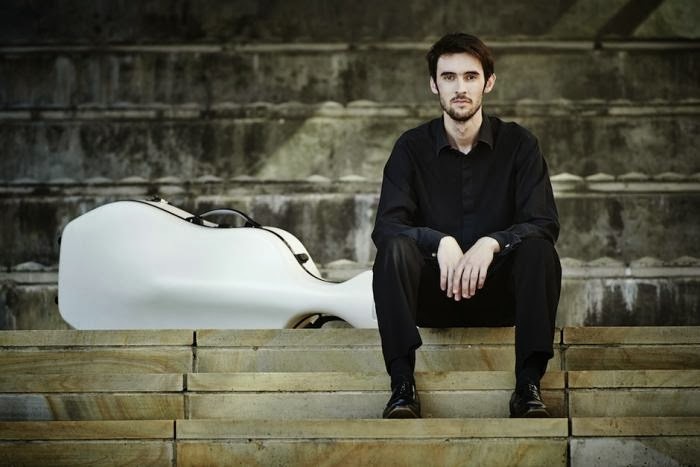 He won second prize in the prestigious Cadaqués Orchestra Conducting Competition and was awarded the first Conductor Fellowship with the BBC Singers. Temple Winter Festival is a new week-long festival at Temple Church from 16 to 20 December 2013. The Temple Winter Festival is a collaboration between Temple Church, Hazard Chase and BBC Radio 3. All performances take place in the Temple Church and are broadcast live on Radio 3. There is a Christmas theme to a number of the concerts, Praetorius's Magnificat V is being performed with the Christmas interpolations, and the festival concludes with Handel's Messiah. In between there is Schubert, Arensky, Bach, Vivaldi and much more with performers including Mark Simpson, James Gilchrist, the Temple Church Choir and the BBC Singers with St James's Baroque. 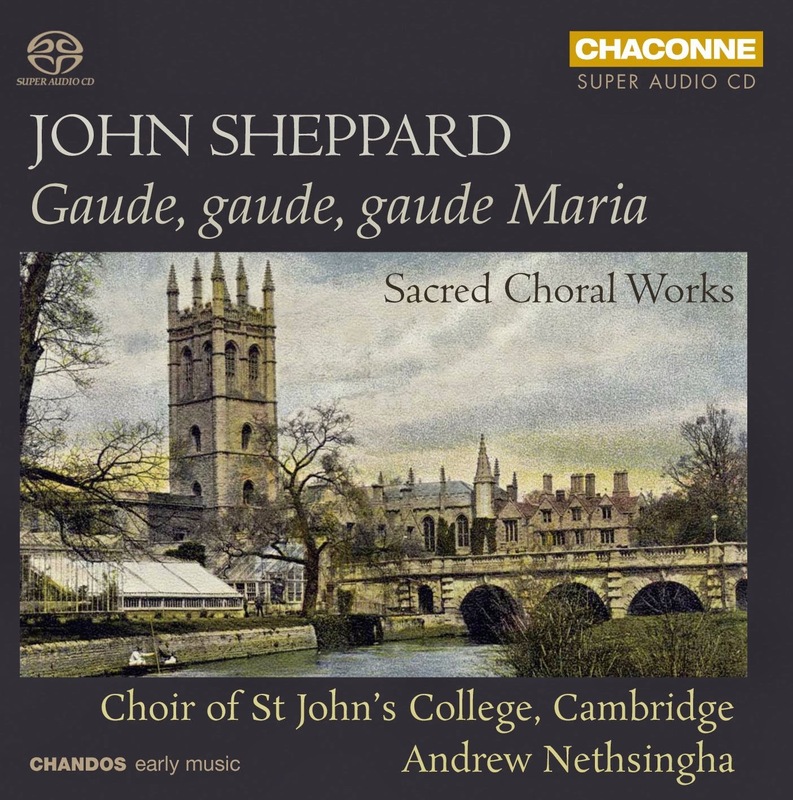 We don't actually know much about John Sheppard (c1515 - 1558), what we do have is his music including the incredible large scale works as Media Vita and Gaude, gaude, gaude Maria virgo. 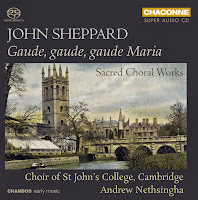 These works have generally been the purlieu of mixed voice consorts on disc, but on this new disc the choir of St. John's College, Cambridge (men and boys) under Andrew Nethsingha have recorded a disc of Sheppard's sacred music centred on Gaude, gaude, gaude Maria virgo. Their programme includes Sheppard's Western Wynde Mass plus In page, in idipsum dormiam, In manus tuas, Domine, Haec dies, Spiritus Sanctus procedens, The Lord's Prayer and Christ rising again. The programme starts with Gaude, gaude, gaude Maria virgo which probably dates from the reign of Queen Mary. It is a large scale work, written for six part choir and whose text combines the Respond and Prose for the Second Vespers on the Feast of the Purification of the Blessed Virgin Mary. A complex piece which wraps the polyphonic respond around the chant of the prose. Nethsinga takes it at quite a steady tempo, making the music quite stately, allowing it to unfold. The choral sound is quite treble led, with a lovely clear treble sound. The recording was made in the chapel of St. John's College, which is very atmospheric but quite a generous acoustic. This means that the interior details can be a bit fuzzy but the overall sound is glorious. Nethsinga paces the work in fine, long-breathed paragraphs giving the feeling of the glorious structure slowly unfolding, with finely sung polyphony in quite widely spaced vocal lines. The polyphony alternates with chant, beautifully realised by John Clapham. Harry Ogg is a young conductor who will be taking up a post as Head of Music Staff and Assistant Conductor at English Touring Opera in January 2014. His recent experience has included assisting Mark Elder on the third act of Parsifal and conducting the Halle on recordings of Britten's wartime film music in collaboration with Colin Matthews. Like many young conductors, in 2009 Ogg formed his own orchestra Sinfonia d'Amici made up of former members of the London Schools Symphony Orchestra. The orchestra have recently been doing concert performances of operas, performing Humperdinck's Hansel und Gretel in April and on 18 December they will be performing Puccini's La Boheme at Cadogan Hall. I met up with Harry Ogg to talk about Sinfonia d'Amici and forthcoming performances. But before we talk of Sinfonia d'Amici, our conversation touches further on Ogg's recent debut with the Halle performing the scores which Britten wrote for the wartime films, An American in England. The recording came about as a result of Ogg's work assisting Mark Elder in act three of Parsifal, and represented his debut conducting a professional orchestra. He describes it as a steel learning curve, but it was clearly a challenge that he relished. 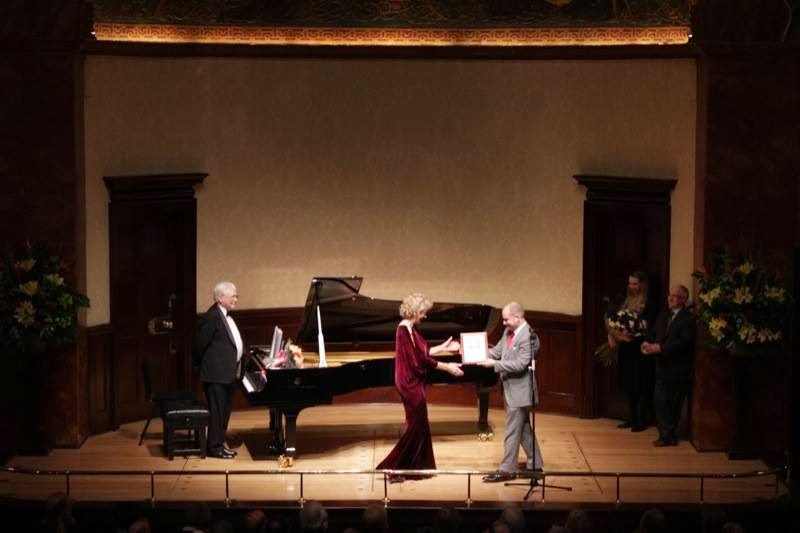 Felicity Lott made her Wigmore Hall debut in 1975 and since then has been closely associated with the hall, performing more than 80 times in nearly four decades. And last night (15 November 2013) she made her farewell recital, her last solo recital in the house. Accompanied, as ever, by Graham Johnson, she performed a varied programme of Schumann, Wolf, Strauss, Frank Bridge, Britten, Bizet, Paul Bernard, Maurice Yvain, Mireille Hartuch and Offenbach. 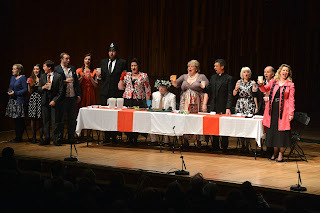 The proceeds for the concert were going to the Wigmore Hall Endowment Fund and, to enhance the rather festive atmosphere, there was a glass of fizz for every audience member at the interval. My own memories of Felicity Lott on the concert platform go back to the 1980's when such Songmakers Almanac recitals as The Ladies Almanc and If Dorabella and Fiordiligi were lieder singers were a revelation as to what could be achieved. 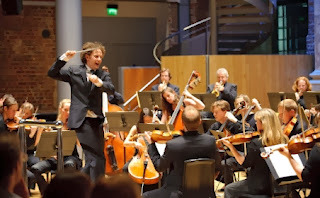 The Aurora Orchestra has announced its 2014 programme and, as you might expect, the result is a rollercoaster of amazing music, ranging from a road trip across America to second Viennese school classics, with artistic director Nicholas Collon conducting many of the concerts. 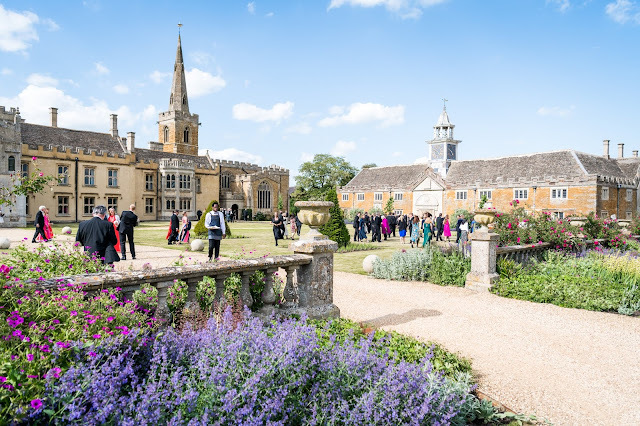 Guests include counter-tenor Iestyn Davies, mezzo-soprano Alice Coote, tenor Robert Murray and hang player Manu Delgado, there will be live visuals and even swing dancing. Road Trip on 4 January 2014 at Kings Place sees the orchestra conducted by Nicholas Collon travelling across America with John Adams Chamber Symphony, Charles Ives The Housatonic at Stockbridge from Three Places in New England, Copland's Appalachian Spring and folk song arrangements by Nico Muhly, sung by the Kentucky born singer-songwriter Dawn Landes. The finals of the British Contemporary Piano Competition were held at the University of Surrey in Guildford last week. Founded by the pianist Philip Mead and now in its 9th year, the competition aims to encourage aspiring professional players to perform contemporary repertoire. The first competition was held in 1988 and the University of Surrey has hosted it since 2006. The winner was Eliza McCarthy, who played pieces by played pieces by Copland, Tansy Davies, Britten, Rzewski, Crumb, Jonathan Harvey, Joe Cutler, Sally Beamish, Berio and Ed Bennett. 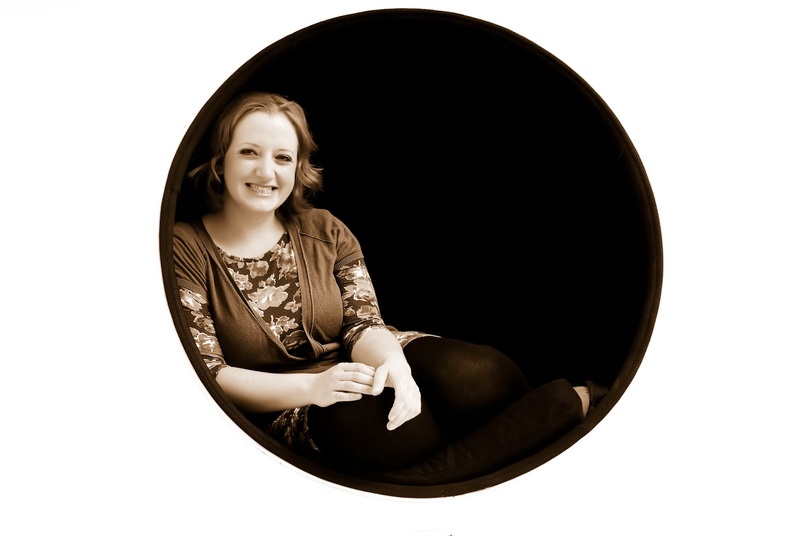 She wins a cash prize of £2,000, the chance to make a studio recording at the University of Surrey’s School of Arts facilities, opportunities for concert engagements, and career-development assistance through the London Sinfonietta. Second prize of £1,000 went to Joseph Houston who played a programme of Holt, Matthews, Ives, Xenakis, Finnissy, Messiaen, and Harvey. Sally Wigan received £500 for finishing third after playing a programme of music by Jonathan Harvey, George Benjamin, Judith Weir, John McCabe and Arlene Sierra. The Jury consisted of Clive Williamson, Artistic Director of the Competition and Professor at the University of Surrey; British pianist and teacher Andrew Ball; and Rolf Hind, Professor at the Guildhall School. Brahms wrote a significant number of lieder but only one song cycle, Die schöne Magelone. Even that cycle doesn't have the cohesiveness of say Schumann's Dichterliebe or Schubert's Die schöne Müllerin. Instead Brahms set 15 songs (romances) from Ludwig Tieck's novella Wundersame Liebesgeschicte der schönen Magelone und des Grafen Peter aus der Provence (The Wondrous Love Story of the Beautiful Magelone and Count Peter of Provence). 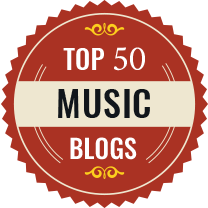 Tieck's story has 18 songs embedded in the text, each in a different chapter, so that the songs are about the character's states of mind rather than progressing any narrative. This means that Brahms's song cycle has difficulty standing on its own. Lacking familiarity with Tieck's original (which was popular in the 19th century), the audience needs to be helped along. 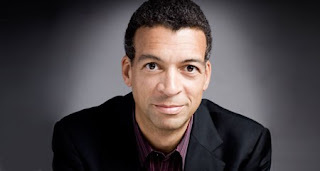 For his performance of Brahms's song cycle for Temple Song at Temple Church on Thursday 14 November, baritone Roderick Williams was joined not only by pianist Julius Drake but by the actor Alex Jennings. Jennings read extracts from Tieck's story between the songs, giving us a clear dramatic context for the songs. Johannes Brahms (1833 - 1897) was clearly very taken with the romance of Count Peter's story. He read it as a 14 year old on summer holidays (with his host's 13 year old daughter). There was more than one telling of the story and Ludwig Tieck's version (written 1796 and revised in 1812) only came to Brahms's attention in 1861 when it delighted him. Also at that time Brahms was performing song recitals (including Dichterliebe, Die schöne Müllerin and Beethoven's An die ferne Geliebte) with the baritone Julius Stockhausen. It was for Stockhausen that Brahms wrote the songs between1861 and 1869. Yesterday (13 November 2013) the Opera and Music Theatre Forum held its conference at the Royal Opera House, Covent Garden. Administrators from opera companies across the UK plus a selection of other opera professionals met to consider what opera was going to be like in 2030. Under the title Future Tense? the conference considered what 2030 might be like and how opera companies might respond. After a funny and inspiring speech from Kasper Holten (director of opera at the Royal Opera House), we heard from three people who helped project what 2030 might be like. Holten's speech, though heavily laced with humour, was a distinct call to arms for opera professionals to co-operate more and to talk about opera with confidence, to celebrate opera and the importance of the arts. That we might need to do so was apparent in the talks that followed. The Russian lyric soprano Ekaterina Siurina gave a recital for Rosenblatt Recitals in 2009 and here she has released a disc in the Rosenblatt Recitals series on Opus Arte. 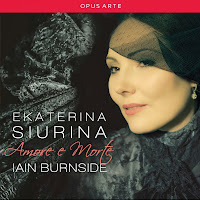 Accompanied by Iain Burnside, Siurina's disc is entitled Amore e Morte and explores the songs of Giuseppe Verdi, Vincenzo Bellini and Gaetano Donizetti. Though Verdi wrote songs throughout his life, his output dropped radically after publishing his set of songs in 1845. Siurina starts with one of his later songs, Stornello (1869). It is a delightful character piece which is lightly ironic and Siurina brings out the song's perky charm. She has a slimline lyric voice, and in this repertoire gives us something of the soubrette, singing with fine focus and pinpoint accuracy. Perduta ho la pace comes from Verdi's Sei Romanze published in 1838. It is a setting of Goethe's Gretchen am Spinnrade in Italian translation. Verdi concentrates on Gretchen's states of mind creating almost a scena and not a bit of spinning in sight. Siurina brings out the drama in the song, giving a nice edge to the voice and shaping the lines well. Today the Opera and Music Theatre Forum's conference takes place at the Royal Opera House, a one day event in which opera professionals will be looking at what the future holds for opera. The conference's title is Future Tense? and the intention is to answer the question 'what will the world be like in 2030 and how will we deal with it?' So I started to think about what was the world like 17 years ago, and how has our opera going changed? What follows isn't a definitive history, instead its an assemblage of what I can remember, a patchwork of events and opera doings from 1996. The Internet was only just beginning and certainly you would never use it to watch opera, internet streaming was years away. If you wanted to watch opera at home then you needed a video tape. DVD's had only just been invented, and everything was on CD and on video tape. Recordings were still a big deal even though record companies had started to reduce investment in new recordings. The LSO Live label would not appear for another four years, and that was very much a trail blazer. The program began with ‘Fantasia XIII in F - Upon one note’ arranged by Britten. Written towards the end of Henry Purcell’s life (1659-1695) this piece requires, in addition to the quartet, a steady C. But in fact the concert began before this – as the audience were settling down Clare Newton sashayed out of the side stall door with her viola and newspaper and proceeded to sit on the edge of the stage and read. When the quartet was applauded on to the stage via the normal route, they all made an act of noticing Clare and wondering what she was doing there. All became apparent when they started to play – she was the missing C. Purcell was a master of heart-wrenching suspensions and in the right hands his music could have been written yesterday. 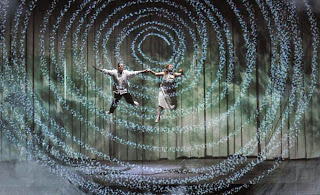 The spectacular opening of the Magic Flute at the ENO was a night not to be missed (7 November at the London Coliseum). 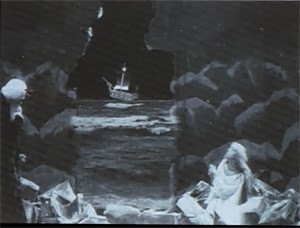 The orchestra, conducted by Gergely Madaras, was raised up almost to the level of the stage and indeed some of the action centred around the pit, the first few rows of audience (although this was projected onto the back screen of the stage so everyone could see). 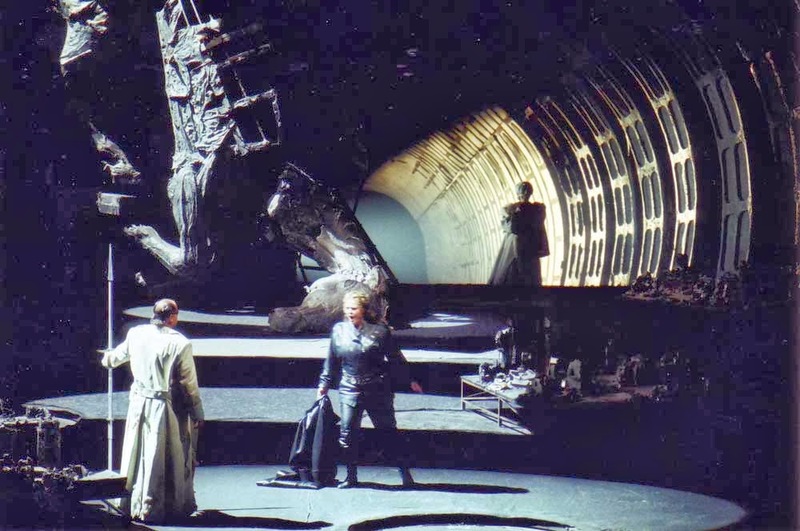 There were also two booths, one each side of the stage which were integral to Simon McBurney’s interpretation of Mozart’s classic 1791 opera. On the left was a video set-up allowing the audience to see the operator interacting with the action on stage. This included real-time ‘cartoons’ drawn on a blackboard and projected onto screens across the stage, puppets, and manipulated backdrops including a giant bookcase. On the right was a more complex arrangement with both video and audio capabilities – and also became the venue for some of the comic asides in the plot. I was recently reading a column in a magazine (not a musical one) and the columnist, who is somewhat younger than I, was proudly proclaiming that he never used Twitter or Facebook and was too old to do so. Yet many of my correspondents do not fit into the youth category, and many arts organisations are finding digital communications (social media in its widest form) important for communicating not only with the young. If you are reading this, then you have some sort of engagement on-line and like many people will probably be used to receiving marketing information via email rather than by post. All arts organisations have entered the digital market in this way. 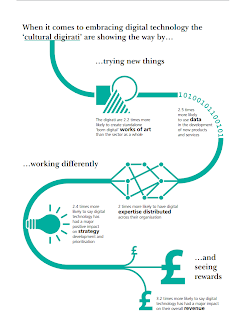 But Arts Council England, the Arts and Humanities Research Council and Nesta have commissioned independent research to track the digital usage by Arts organisations over the next two years. And of course, this doesn't just involve emailing people! The Sixteen, conductor Harry Christophers, brought their programme Ceremony and Devotion: Music for the Tudors to Temple Church on Monday 11 November, as part of the concert series organised by the Temple Music Foundation. A packed Temple Church heard the choir performing music by John Sheppard, William Byrd and Thomas Tallis. The programme explored the Latin church music of all three composers with Sheppard's Media vita and Sacris solemniis, and Tallis's Jesu salvator, saculi redemptis and Iam Christus astra ascendera all written during the reign of Queen Mary when Latin church music played a vital role in the liturgy. Plus Tallis's Miserere mei and Byrd's Laudibus in sanctis, Haec dies and Infelix ego from the reign of Queen Elizabeth when Latin sacred music had a less clear cut role. They opened the programme with the plainchant hymn Veni creator spiritus sung alternim by the basses and sopranos, initially from the body of the round church and then processing through the nave. The chant was sung at a lovely steady pace with good full toned voices.